The landing process must never be considered complete until the airplane decelerates to the normal taxi speed during the landing roll or has been brought to a complete stop when clear of the landing area. The pilot must be alert for directional control difficulties immediately upon and after touchdown, and the elevator control should be held back as far as possible and as firmly as possible until the airplane stops. This provides more positive control with tailwheel steering, tends to shorten the after-landing roll, and prevents bouncing and skipping. Any difference between the direction the airplane is traveling and the direction it is headed (drift or crab) produces a moment about the pivot point of the wheels, and the airplane tends to swerve. Loss of directional control may lead to an aggravated, uncontrolled, tight turn on the ground, or a ground loop. The combination of inertia acting on the CG and ground friction of the main wheels during the ground loop may cause the airplane to tip enough for the outside wingtip to contact the ground and may even impose a sideward force that could collapse one landing gear leg. [Figure 13-4] In general, this combination of events is eliminated by landing straight and avoiding turns at higher than normal running speed. Figure 13-4. Effect of CG on directional control. To use the brakes, the pilot should slide the toes or feet up from the rudder pedals to the brake pedals (or apply heel pressure in airplanes equipped with heel brakes). If rudder pressure is being held at the time braking action is needed, that pressure should not be released as the feet or toes are being slid up to the brake pedals because control may be lost before brakes can be applied. During the ground roll, the airplane’s direction of movement may be changed by carefully applying pressure on one brake or uneven pressures on each brake in the desired direction. Caution must be exercised when applying brakes to avoid overcontrolling. If a wing starts to rise, aileron control should be applied toward that wing to lower it. The amount required depends on speed because as the forward speed of the airplane decreases, the ailerons become less effective. 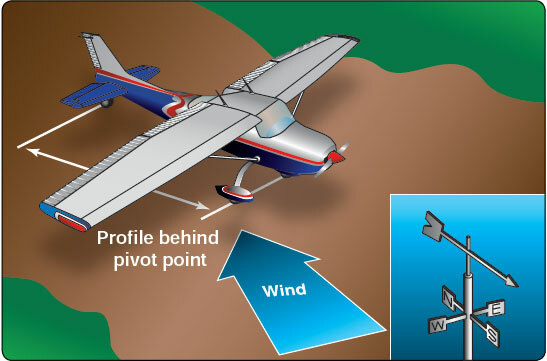 Particularly during the after-landing roll, special attention must be given to maintaining directional control by the use of rudder and tailwheel steering while keeping the upwind wing from rising by the use of aileron. Characteristically, an airplane has a greater profile or side area behind the main landing gear than forward of it. With the main wheels acting as a pivot point and the greater surface area exposed to the crosswind behind that pivot point, the airplane tends to turn or weathervane into the wind. [Figure 13-5] This weathervaning tendency is more prevalent in the tailwheel-type because the airplane’s surface area behind the main landing gear is greater than in nosewheel-type airplanes. Pilots should be familiar with the crosswind component of each airplane they fly and avoid operations in wind conditions that exceed the capability of the airplane, as well as their own limitations. While the airplane is decelerating during the after-landing roll, more aileron must be applied to keep the upwind wing from rising. Since the airplane is slowing down, there is less airflow around the ailerons and they become less effective. At the same time, the relative wind is becoming more of a crosswind and exerting a greater lifting force on the upwind wing. Consequently, when the airplane is coming to a stop, the aileron control must be held fully toward the wind. Upon touchdown, the airplane should be firmly held in a three-point attitude. This provides aerodynamic braking by the wings. Immediately upon touchdown and closing the throttle, the brakes should be applied evenly and firmly to minimize the after-landing roll. The airplane should be stopped within the shortest possible distance consistent with safety. 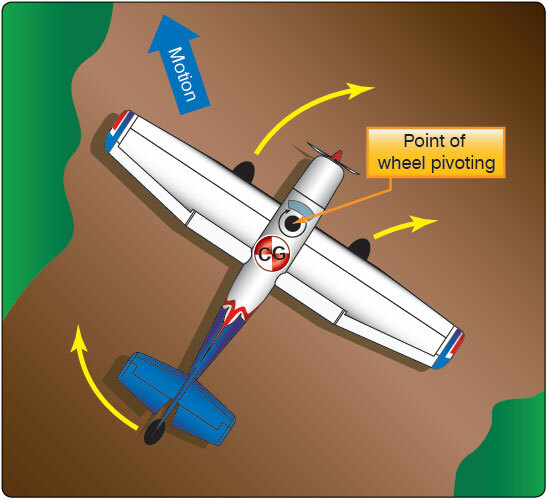 The tailwheel should touchdown simultaneously with or just before the main wheels and should then be held down by maintaining firm back-elevator pressure throughout the landing roll. This minimizes any tendency for the airplane to nose over and provides aerodynamic braking. The use of brakes on a soft field is not needed because the soft or rough surface itself provides sufficient reduction in the airplane’s forward speed. Often, it is found that upon landing on a very soft field, the pilot needs to increase power to keep the airplane moving and from becoming stuck in the soft surface. A ground loop is an uncontrolled turn during ground operations that may occur during taxi, takeoff, or during the after-landing roll. Ground loops start with a swerve that is allowed to continue for too long. The swerve may be the result of side-load on landing, a taxi turn started with too much groundspeed, overcorrection, or even an uneven ground surface or a soft spot that retards one main wheel of the airplane. Due to the inbuilt instability of the tailwheel design, the forces that lead to a ground loop accumulate as the angle between the fuselage and inertia, acting from the CG, increase. If allowed to develop, these forces may become great enough to tip the airplane to the outside of the turn until one wing strikes the ground. To counteract the possibility of an uncontrolled turn, the pilot should counter any swerve with firm rudder input. In stronger swerves, differential braking is essential as tailwheel steering proves inadequate. It is important to note, however, that as corrections begin to become apparent, rudder and braking inputs need to be removed promptly to avoid starting yet another departure in the opposite direction.